We have already seen cool ways to convert photo to cartoon and photo to paintings. Using free version of Photo 2 Sketch you can generate impressive sketch image from any photo. 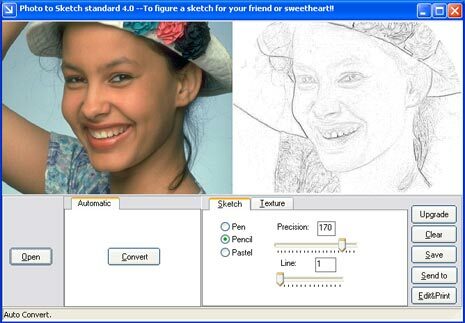 You can convert photo into simple pen sketch or into details pencil sketch. There is also option for pastel sketch for more colorful sketch option. 1. Download Photo 2 Sketch [1.06MB, weblink]. 2. Install this software and launch it. 3. Click Open to select and open image in the application window. 4. Configure options under Sketch and Texture tabs. 5. Click ‘Convert’ button to see final sketch of selected image. 6. Click Save button to save final sketch on the computer. ArcSketch is free online sketch pad to draw/paint anything freely, it also offers many tool to customise your canvas i.e. you can select the color of pencil, you can select the size of pencil, you can customize the canvas size etc. You can also upload the image on canvas and edit the way you want.